20 Years After Apartheid, South Africa Asks, 'How Are We Doing?' : Parallels The African National Congress should cruise to victory in Wednesday's election. But a party that once represented the new South Africa faces growing criticism for corruption and complacency. The Rev. Desmond Tutu, shown during a press conference last month in Cape Town, has been sharply critical of South Africa's political leadership as the country marks 20 years since the end of apartheid. He said he wouldn't vote for the ruling African National Congress in Wednesday's election. When South Africa buried apartheid with its first all-race election in 1994, the Rev. Desmond Tutu danced with joy as he cast his ballot. He called it "a religious experience, a transfiguration experience, a mountaintop experience." As the country votes Wednesday, here's what he recently told the Sunday Times newspaper: "I didn't think there would be a disillusionment so soon. I'm glad that (Nelson Mandela) is dead. I'm glad that most of these people are no longer alive to see this," a reference to a host of chronic problems such as corruption and poverty. 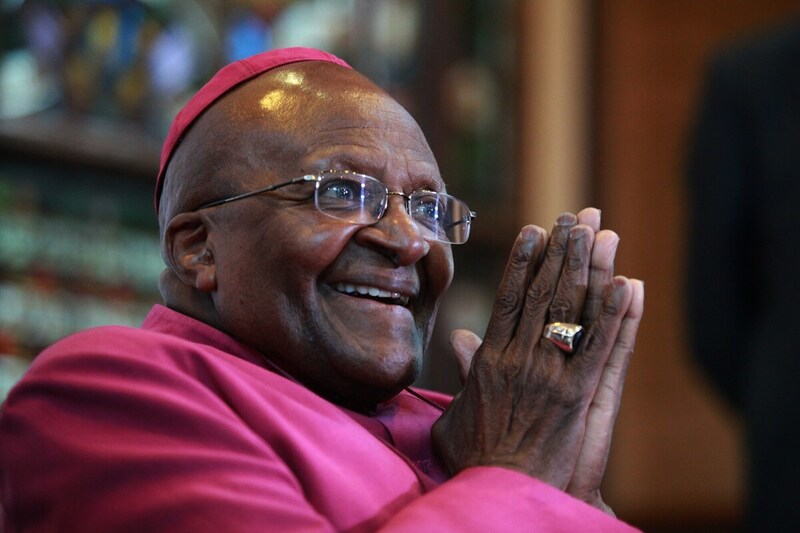 Tutu, a Nobel Peace Prize laureate who is often described as the country's moral beacon, also said he won't vote for Mandela's party, the African National Congress, which has ruled for 20 years and is again heavily favored. His comments are part of South Africa's favorite debate, waged nonstop since the end of apartheid, on whether the country is getting better or worse since the remarkable transition it navigated two decades ago. So what's a fair accounting of South Africa today? The optimists say it remains the most advanced country in Africa, with thriving cities that are integrated into the global economy. Millions of blacks have been educated and risen out of poverty. The country's broad successes offer hope for others on a troubled continent. Tutu himself acknowledges all this. But many also agree with him when he says the country's leaders have fallen far short of the moral example and high standards set by Mandela, who died in December at age 95. Government corruption is an endemic problem. Violent crime has not been tamed. The HIV/AIDS rates are among the highest in the world. Squatter communities just keep expanding, and millions of poor blacks have seen little or no improvement in their lives. 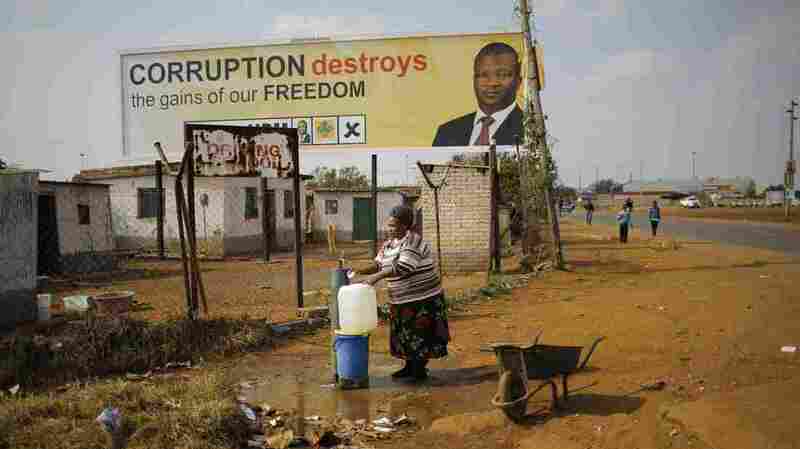 A women fills up water buckets in front of an election billboard near Johannesburg on Tuesday. Opposition political parties, like the one featured here, say that corruption is a major problem in the ruling African National Congress. A new book, South Africa @20: For Better Or For Worse, has gathered a wealth of facts and figures for this very debate. But even the numbers are open to conflicting interpretations. For example, South Africans routinely talk about a stubborn unemployment rate of 25 percent or higher to make the point the country is not creating nearly enough jobs. Yet some economists argue that this traditional measure of employment only counts formal jobs and vastly underestimates those in the informal economy, from street hawkers to part-time gardeners to guys who watch over parked cars to make sure they don't get stolen. When you factor in the informal economy, the picture changes dramatically, these economists argue. "People totally excluded from any form of economic activity, including the informal sector, is possibly as low as 11 percent," writes labor economist Loane Sharp. The more than 40 experts contributing to the book tend to see South Africa's glass as being half-full. As evidence, they note that 85 percent of South African households have access to electricity, 84 percent own a color television and 95 percent of households have at least one cellphone. 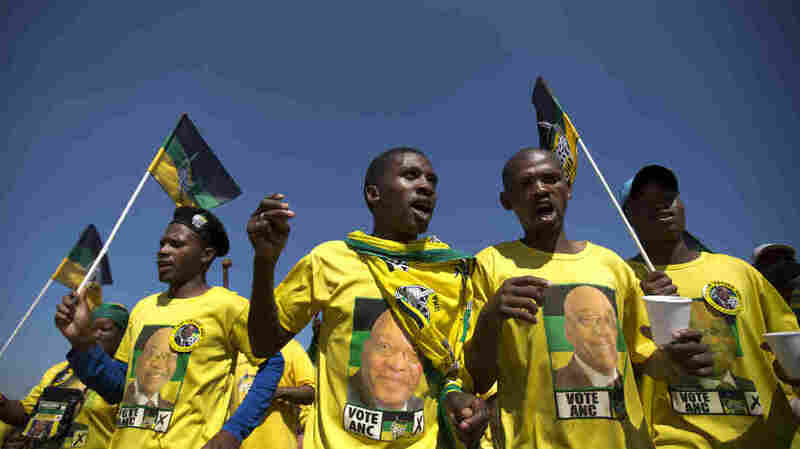 Supporters of President Jacob Zuma and the ruling African National Congress stage a rally Saturday near Johannesburg. The party has led South Africa for 20 years and is heavily favored Wednesday but faces increasing criticism. In the big picture, these are all significant improvements. Yet many feel the country's mood has been in decline and the ANC has grown complacent after 20 years of virtually unchallenged rule. The optimism that accompanied its early years in power has given way to cynicism. President Jacob Zuma, 72, who is expected to win another five years in power, has always been a polarizing figure. A recent anti-corruption report criticized him for spending more than $23 million to upgrade his private home, including amenities such as a swimming pool and an amphitheater. He was booed at a memorial service for Mandela last December even though the crowd was dominated by members of his party. For those struggling to get ahead, a common complaint is that only people with connections to the party or the government are advancing. There's even a name for them: "tenderpreneurs," a reference to businessmen who are skilled at getting government contracts, or tenders. Polls show the ANC is likely to get around 65 percent of the vote. It has been able to organize huge election rallies, and many of its supporters remain deeply loyal and are willing to overlook flaws in the party that fought apartheid for decades. But political analysts say the aura of Mandela and the loyalty of older voters won't last forever. For the first time, black South Africans born just after the end of apartheid — known as "born frees" — are eligible to vote and will be passing their own judgment on how the country is doing. Greg Myre, the international editor of NPR.org, covered South Africa's first all-race election in 1994. You can follow him @gregmyre1.